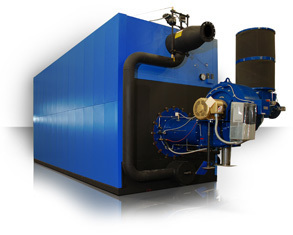 EVOLV INDUSTRIAL boilers are the latest design and application solution for industrial applications. EVOLV INDUSTRIAL boilers are the latest design and application solution for industrial applications. All of our boilers are manufactured with the most modern, engineered heat exchanger design to produce output with the industry’s highest available efficiencies without the need for external heat extraction apparatus. At Evolv, our boilers offer the fastest heat up times available with usable energy in 13 minutes from a cold start. The specific design of the high performance heat exchanger incorporates a membrane type wall design without the need for welded webbing found on all others. This feature allows for quick and easy access to specific boiler tubes if required. A full 5 gas passageway is engineered in the design allowing for maximum use of available combustion gasses. By design, the heat exchanger can expand and contract within the heavy duty shell and enclosure. Furnaces are generous to maximize radiant transfer rates in the combustion zone which also allows for inherently less emissions as standard. The robust enclosure is gas tight to 5” wc as standard and the housing is comprised of individual, removable, fully insulated and gasketed 11 GA. steel, reinforced panels. There is no need to “cut your way in, weld your way out” with EVOLV. It is designed to be as maintenance friendly as it is high performing. Owners will appreciate the tremendous fuel usage savings, operators will appreciate the ease of access to both the fire-side and the water-side. Engineers will find working with EVOLV personnel a dedicated partnership in a successful assignment.